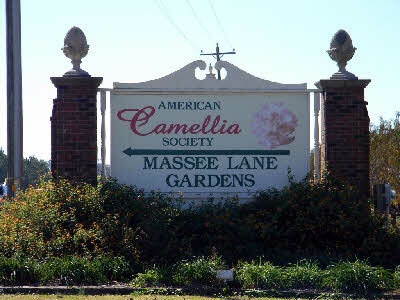 The formal camellia gardens at Massee Lane began as the private garden of David C. Strother in the 1930s. As his love affair with camellias grew, Strother soon surrounded his farmhouse with camellias. He then began the gardens that are now Massee Lane. Year by year, he expanded the garden borders to accommodate the new camellias he wanted to grow. In 1966 Mr. Strother donated these gardens and the rest of his 150-acre farm to the American Camellia Society to serve as its headquarters. The same gardens are graced with large plantings of a long succession of azaleas, both native and exotic species and hybrids. There are also Lady Banks roses at this time. Hydrangea and Satsuki Azaleas bloom in May. The hydrangeas continue through June and beyond. Currently, over 1,000 varieties of camellias can be found in the gardens. While the largest number of cultivars is of Camellia japonica, sasanquas, hybrids and a number of species add variety to these plantings. There is a two-acre garden which is the "Seedling Forest" which is an area where Dave Strother planted camellia seedlings as well as new cultivars for evaluation. In 1969 the Thomas Jefferson Smith Memorial Greenhouse was built to shelter frost-tender camellia species, as well as to demonstrate the art of growing camellias under glass for the production of show flowers. The development of the "New Camellia Garden" continues with the plan for it to feature several different camellia collections. The Camellia species collection continues to be expanded to be as complete a collection of the wild Camellia species as can be safely grown out in the open in middle Georgia. A demonstration tea planting will also be established for educational purposes. A collection of those species of Camellia that are grown for tea, as well as tea cultivars, will be exhibited. 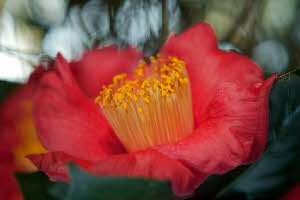 Another planting will feature those Camellia species that are grown for tea oil, one of the finest culinary oils. A collection of fragrant camellias will be another feature of this garden.